Before writing about the last year of Soviet rugby about a new admission to the collection. This is a medal winner of the tournament for the prize of the newspaper "Socialist Industry" 1976. 1991 was very eventful, despite the fact that the USSR did not participate in the World Cup. In May the USSR team flew on a tour of New Zealand! It was played 8 matches. 4 wins and 4 losses. And in the autumn they played their last matches in England. After that a new story began, the history of Russian rugby. The Soviet Union broke up and it was a difficult time for rugby in Russia too. Dozens of teams ceased to exist. The Russian Championship was reduced to 5-6 poor teams. Programs of matches were also issued rarely. But the Barbarians arrived in Russia in 1992! I was at this match, but unfortunately I did not collect the programs then. I do not even know if they were printed. But in Krasnoyarsk programs of the Barbarians were printed. And this is the program of Russia from France. I did not understand. Was the program printed for the Russia-Barbarians match? Probably the VIP program was printed, I do not know. This program Krasny Yar - Barbarians. I think this is a vip option. You can scan the last page and I'll tell you who did it. It is the emblem of Krasny Yar. No need to think that this is a pirated program. It was sold at the stadium and was released by the Krasnoyarsk Rugby Federation. Really love your unique collection. Do you have any programmes from this years Rugby Europe Championship? Unfortunately i have almost nothing. Only tickets from Spain and Georgia. That's a pity. 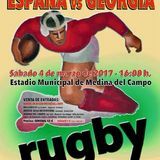 I know Spain issued programmes for the games against Russia and Georgia. The German Union always issue programmes as well. [quote="mooncatt"]That's a pity. 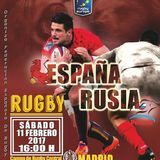 I know Spain issued programmes for the games against Russia and Georgia. The German Union always issue programmes as well. My friend from Madrid did not go to the match because of the weather. In Germany i do not have any familiar collectors. And yet the rugby matches of the matches continued to be printed. This program is 93 year. Russia - France / Italy European Championship. Krasny Yar - VVA / Fili of the Championship of Russia. We have already been to New Zealand, Australia and the UK. It remaned only to fly to South Africa. I do not know where our federation rugby got money (it seems that something is related to diamonds), but in 94 the Russian team went to Johannesburg! Medals champion and second place of the championship of Russia in the USSR. And these are records of several matches of the USSR Championship of 90 and 91 years.